Although no longer in the Arctic Circle, the day started in darkness. Winter’s delayed sunrises have begun. Starting to check messages from the night before my phone had multiple spam texts, they’ve found me. Didn’t think much of it until a notification popped up that some random person’s desktop computer disconnected, meaning they were connected to my cell phone. Oh boy. Thinking I could fix it by encrypting, something blocked the encryption from completing forcing me to wipe the entire phone. Oh jeez. Welcome to Russia. Lesson learned, encrypt your phone’s before entering countries with the world’s most sophisticated hackers. Trying not to let that set the day off to a bad start, I enjoyed the included buffet breakfast of scrambled eggs, salami, cheese, fruit, and toast. There’s nothing like free food to lift my spirits. I decided I was going to leave my cell phone in its rather useless state and just add the Google Translate app and the In Your Pocket app. Otherwise it will remain a dumb terminal. Having only one full day in St Petersburg it had to be focused and prioritized. I decided to spend the first few hours touring the historic district seeing everything starting at St Isaac’s Cathedral and working my way to palace square to admire the Hermitage and Winter Palace before making my way to the very ornate Church of the Savior on the Spilt Blood. 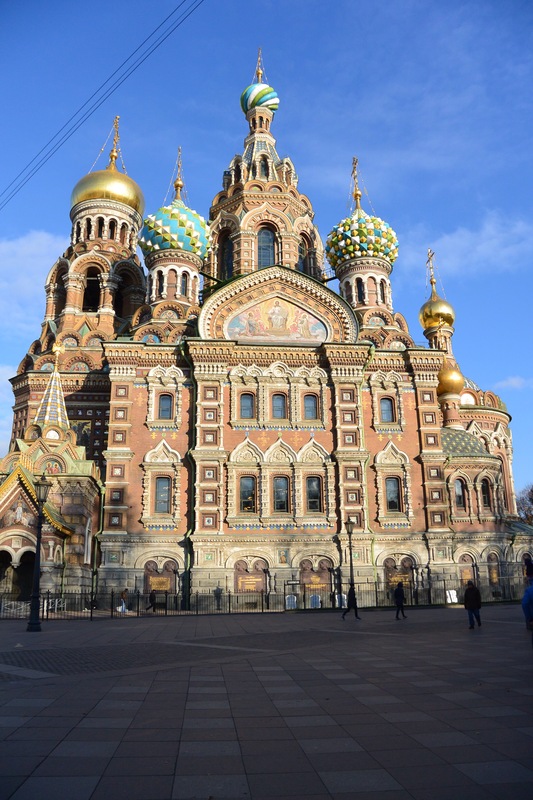 That church is exactly what you think of when you think of St Petersburg and it’s colorful round turrets, absolutely gorgeous. Just behind is a lovely garden with trees already changed for Autumn lining the sidewalks to guide your way to the Troitskiy Bridge, which looks like the ones you see in car chases in movies filmed here. Speaking of movies, when I arrived at the Peter and Paul Fortress just on the other side of the bridge they were filming a period war piece. Everyone was dressed in historic outfits with carriages and everything. Having lived in NYC for a bit I pretended I understood the Russian commands coming my direction as stumbling on movie sets is something I’ve done countless times. The fortress was a bit like a little town with a cathedral and everything. I had kind of expected something more medieval and castle looking, but that was not the case. It was still interesting nonetheless. Realizing it was already 2pm, I headed off to see more sights. Just outside the fortress was a gorgeous mosque that I felt compelled to photograph. The weirdest thing as soon I clicked the button my SLR literally shutdown. The battery had been full. It refused to turn back on as if something had zapped it into not functioning preventing the shot. Weird. Not being thrilled about losing my photo abilities I decided to make my way back to the hotel to see if I could tinker with it back to life. I had wandered quite a bit so was about 45 min or so away. Luckily tinkering with the camera a bit I was able to resurrect it, I’m still not clear on what happened but adore my Nikon 1 so would have been crushed to finish the trip without it. Such a relief it is working again! With a functional camera I was off. My goal for the last few hours of the day was to tour a palace. Debating between the Winter Palace and the Yusupov Palace I chose the later. Mainly because the stuff online said the first one would be more crowded and focused on art. I’m more of an architecture lover, so Yusupov was the winner. Having read online they did guided tours, I in my best Google Translate fashion tried to articulate my desire for a human led tour. No matter how many ways I could come up with typing it in, it was not understood. I tried to ask if self was the only option, also an unsuccessful question, and eventually gave up and just did self guided. The beautiful marble double staircase greets you upon arrival and after ascending a gorgeous crystal chandelier. The bulk of the mansion has been restored and is quite lovely. Grand ballroom, Turkish bath, private theater (and let me just say, this was like uber elegant ornate like mini version of fancy grand opera theatre). This place was incredible. They clearly had insane amounts of money and no qualms about showing it off. Can’t speak for the many other palaces in this city, but I was happy with the choice. As nightfall was lurking I snuck in one more beautiful cathedral with bright blues and gold embellishment. Then it was time to get back before dark. One of the In Your Pocket recommended restaurants was next door to the hotel so I went for easy. They had an English menu and the waitress knew a few words, my first human encounter in Russia without complete dependence on Google Translate. Although it felt like such a relief, I know the further East I head the more non existent English will be. Darn Google Translate for not having a Mongolian edition! The lady a few tables away was clearly also from America, traveling solo, perhaps for work. She phoned someone and ended it with the most beautiful salutation. In the calmest and matter of fact tone, she softly said ‘I love you…I’ve always loved you…you are the light of my life’. I couldn’t help but think that’s got to be such an amazing feeling to have, such a great place to be, so beautiful. Though how much she must miss that person, how maybe that’s what homesick feels like, it’s having a spouse/family at home you love more than where you’re at/your travels. The menu at Jerome was an eclectic mix of local, Asian, and European. Given my throat started to feel like the early signs of coming down with something, I went for the veal stew with mashed potatoes. Having not had a proper meal in two days, I decided to be naughty tonight and order the carrot cake with dessert wine. Perfect pairing thanks to the waitresses suggestion. After which I decided since for the first time in 4-5 days that I haven’t felt uneasy going back to my hotel, I went for another glass of wine and a bit more window watching as the city life passed by. Street signs everywhere lit up in neon Russian letters, no English in sight. Uniformly sized buildings that start and end without and distinguishing characteristic, and in a rather unusual French colonial look. Hard to say how old they are, perhaps 1800s give or take a century. Street crossing function as in every big city with the little green and red men and the painted walkways. With the exception of the unfamiliar letters it’s very reminiscent of European big cities. Vehicles look Western and drive on the righthand, everything appears very first world in my limited exposure and experiences. Feeling like I saw and experienced my top goals for the one day, it was time to head back to the hotel to get again fall asleep to the sounds of Russian MTV. Life is good.